Lucasfilm and Marvel comics from the next issue of the Star Wars: Poe Dameron ongoing comic book series. 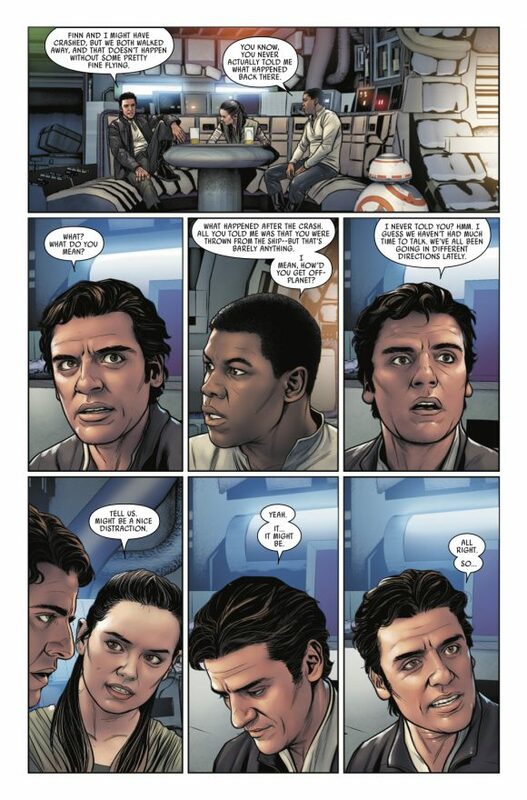 Poe Dameron #26, which hits shelves on April 18th, begins to tell the story of what happened to Poe during the events of The Force Awakens between crashing on Jakku with Finn and his reappearance on Takodonna. The preview, which was released online by 13th Dimension, features the first few pages of the issue where we see Poe, Finn, and Rey all together on the Millennium Falcon after the events of The Last Jedi. The trio are reflecting on how they could have met each other sooner, which leads to Finn asking Poe to tell them how he escaped Jakku. You can read the entire preview here. 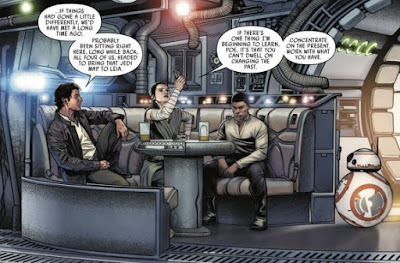 The Poe Dameron comic book series began in April 2016 and has been telling stories set prior to the events of The Force Awakens for 25 issues so far. This new issue is breaking new ground, both for the series and for Star Wars storytelling in general. Not only will it tell a story set within The Force Awakens (all we know about what happen to Poe is that he was thrown from the crash and then managed to escape Jakku...somehow), but it also marks the first bit of post-The Last Jedi storytelling we've seen so far. It's also the first conversation between our three main heroes from the sequel trilogy. Star Wars: Poe Dameron #25 is written by Charles Soule with art by Angel Unzueta, it hits shelves on April 18th.